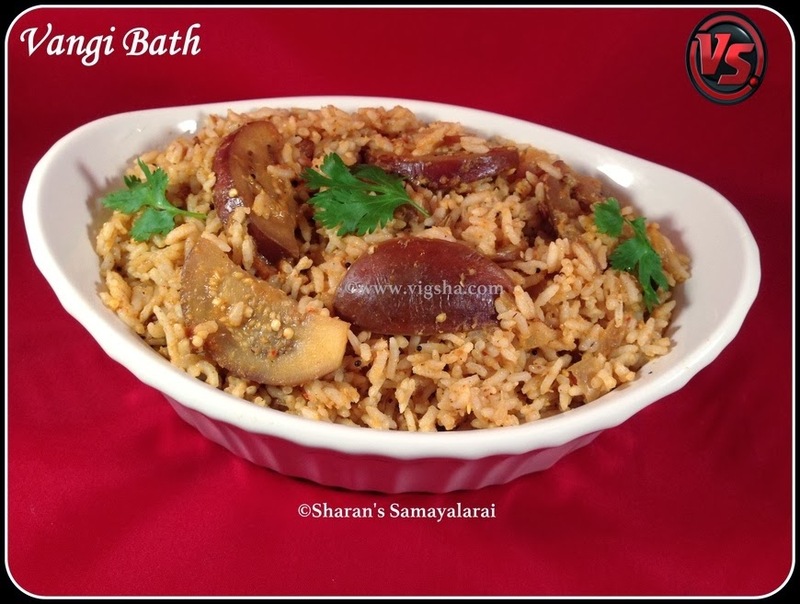 Vangi Bath / Brinjal(Eggplant) Rice is simple flavorful and good lunch box recipe. This is from Andhra/Karnataka Cuisine. I am not a big fan of Brinjal, but its my mom's fav. When I visited Indian stores, I saw fresh brinjal's and bought few. I normally prepare Vankaya Pulusu or Brinjal Kuzhambu. But this time, wanna try something new. So mom suggested me this recipe and I really liked it. 2). Dry roast the ingredients listed under "T0 Roast and grind". Let it cool and grind it to a smooth paste with little water. 3). Heat oil in a pan, add the mustard and let it splutter. Then add cumin, when they splutter add the hing and curry leaves. Then add the onions and saute well till they turn transparent. 3). Add brinjals with turmeric and salt, mix well. Saute till they are nearly done. 4). Add the tamarind extract along with grounded masala and let it cook till the brinjals are completely cooked. 5). When it reaches silky texture switch off the stove. Dont keep stirring and mash the brinjal.Add the cooked rice and mix gently. Check for salt and adjust accordingly. Serve hot with raita or chips of your choice. # You can chop/slice the brinjal of your choice. # You can add cashewnuts / peanuts in the "roast and grind list". It helps to enhance the flavor. # Make sure that the rice grains are separate, otherwise it will become mushy.